On Saturday and Sunday, we had practice days on Maskwa and it wasn't just for the new people. The Maskwa veterans also need the time to shake out the cobwebs and get out of hibernation mode and back in to sailing. Saturday was good day. We had a moderate breeze (10-15 kts.) out of the north and we were able to practice tacks... and a lot of them and some times in rapid succession. On Sunday, we were welcomed to a stiff breeze (15-20 kts.) from the S-SW. We rigged up the boat for a spinnaker and practiced jibing the pole while still at dock. In the middle of jibe practice we were surprised by a visit from Scott! We were all glad to see him on the boat and he was glad to be on the boat. I'm sure any sailor can tell you, simply being afloat does wonders for the spirit. After Scott and Nicole left, we got ready to shove off. A small storm cloud rolled its way over the harbor but, as it passed the skies cleared and we were welcomed to a sunshine and strong winds. So, out to the Lake we went. Given the heavy conditions and the small crew we had, we decided to skip spinnaker practice and decided to show everyone how to reef the main. As Joseph Conrad once said, "Any fool can carry on but, a wise man knows how to shorten sail in time." We also discussed how to see the wind and on the way back to Burnham, we gave a demonstration of set an outside lead on the jib. 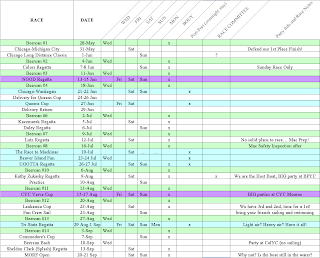 It was a very productive weekend and I am looking forward to the Chicago - "Michigan City" races next weekend. With any luck we will able to put another 1st place flag on our stringer.